This document explains how to get started with the Vulkan graphics library by downloading, compiling, and running several sample apps. Before beginning, make sure you have the right hardware and platform version prepared. You should use a device that supports Vulkan, running Android API level 24 or higher. You can confirm your Android version by going to the Settings menu, and selecting About <device> > Android Version. Once you’ve confirmed that you have the right hardware and platform version set up, you can download the necessary software. Before getting started, you must download several tools and other software. Note that on a Windows host, it is recommended that you avoid a deep file path hierarchy for tools and source code; this is to work around file path limits on some Windows OS versions. If you don’t already have Android Studio, download it. This includes the most recent Android SDK. Install NDK from within Android Studio or download it manually. Refer to Shader Compilers for more Shaderc documentation. Automatically with Android Studio. To do so, choose File > New > Import Sample, then select NDK > Vulkan API Samples. You may see errors about missing components or missing SDK version. When these messages appear, follow the installation prompts that Android Studio shows you. These steps should fix the errors automatically. After several minutes, the Project pane should resemble the window shown in Figure 1. Figure 1. Project pane displaying samples after they've been imported. Open samples with Android Studio. To do so, choose File > Open, navigate to the cloned source directory, and click OK. 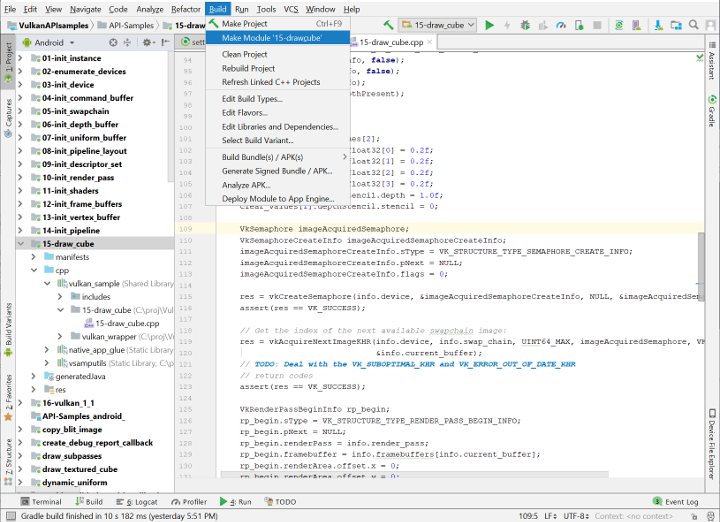 Select your project in the Android Studio Project panel. From the Build menu, choose Make Module <module-name> ; or select Build APK to generate APK. Resolve any dependency issues, and then compile. As Figure 2 shows, you can select individual projects to compile by choosing them from the configuration pulldown. Figure 2. Selecting an individual project to compile. Note: Additional tutorial samples illustrate the use of shaders compiled with off-line compilation integrated into Android Studio. For simplicity, each tutorial is self-contained, and builds according to standard Android Studio build procedures. To run your project, choose an APK to run by choosing Run > Run <project-name>. To debug an APK, choose Run > Debug <project-name>. For example, for drawcube, run 15-draw_cube. Figure 3. The successfully compiled program runs and produces a display. The samples use a dynamic loader helper function defined in vulkan_wrapper.h/cpp to retrieve Vulkan API pointers using dlopen() and dlsym(). It does this rather than statically linking them with vulkan.so. Using this loader allows the code to link against API level 23 and earlier versions of the platform. Those earlier versions don’t include the vulkan.so shared library, but can run on devices that support Vulkan API. The following snippet shows how to use the dynamic loader. #include "vulkan_wrapper.h" // Include Vulkan_wrapper and dynamically load symbols. Sources used in this doc are from Vulkan API Samples, refer to README.md for more descriptions. Vulkan API Samples repo is a snapshot from the upstream repo, follow the build instructions there to generate the latest version. Shaderc code in NDK is downstream of the Shaderc repo. If you need the latest Shaderc, refer to Shader Compilers.